Here are links and info I have compiled thus far. Some data I have obtained from one of the resource threads here, some on my own, and some from the link above. d/b/a Lombard Information Resources, Inc. Note: You must include the top part of IRS Form 1040 with identifying information, a paycheck stub, or W2. It's also interesting to note that MOST all of the above linked sites, actually state right on them that you are entitled to one report free per every 12 month period. Innovis did not, Lombard/Lakeside did not have a website I could find. Lexis/Nexus was also a toughie, with no notice and no instructions on how to order your report, but they must follow the same rules as everyone else. I had a denial at one point (not a denial, but a higher interest rate, so it counted as a denial) allowing me my RiskWise report. It was squeaky clean. Feel free to respond and add others. With your permission, I'd like to include it over in the reference forum. Sure thing, I'd be honored. Linked this post in the Database forum, that way any additions will be available both here and in there. I could not find the list on their website however. Wow.....just found some more (see above). Note that many of them do not specialize in consumer reports, and you won't be getting a personal file from them. I just included the info in case others (who own businesses) might be interested in contacting these specialty CRA's. Anyone ever got a report from them? Just called the number and boy was the rep fiesty. She demanded to know how I got their number! I explained under FACT Act, I was exercising my right to inquire if any utility company had information about me in a file. She claimed I had called Equifax and that they are providing this service for NCTUE's files. She took my information and placed me on hold and after two minutes came back on and stated I had nothing on file. She thanked me for calling. Anyone else use this yet? Anyone with a "written" report? Note: No toll free #?!? I already emailed em to find out for sure. below). Please contact me if you have any further questions. Credit Transaction Act (FACT Act)? I just called them myself to request a copy of my report using the FACT and after 5 mins on hold they tried to sell me claiming the FACT act has not rolled out for the Northeast yet. They wanted 8.50. The rep was not happy when I replied that NJ already has a state law stating that I am allowed a disclousre every 12mos but she did send one out! They offered to send me a free copy (required by law under these circumstances in Colorado) of my report. but the fax number given is 215-615-7604. Why would a company in Illinois be writing me from Ohio? Why would a company in Ohio have a fax number in Pennsylvania? Why would a company in Ohio mail letters postmarked ZIP 11735? Why would a sane person mail these mysterious people all his personal credit information? How do I request a copy of my person report information? (PLEASE NOTE: Information submitted to LexisNexis as part of a request for a copy of information about yourself will be used solely in fulfillment of that request for information and for no other purpose.) You can request a copy of your person report found in the Accurint services by using a secure electronic Web form. A charge of $8.00 for this service will be required via credit card when using this form. <A name=request>How long will it take to receive my report? Your person report will be returned to you via U.S. Mail after LexisNexis receives proof of your identification. LexisNexis must verify your name and address before processing this request to ensure your personal privacy. Sorry, If I have broken any rules here..just trying to make it more convenient for finding things. Have a great day..
Lexis Nexis says that their report costs $8.00. I just sent them a letter requesting my report without any money enclosed and they sent it to me. 1. 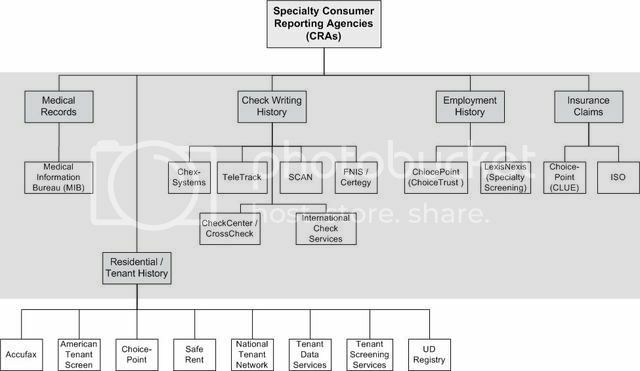 There is a "nationwide" component to being a SCRA... You have to be a certain size before you are subject to the FCRA. 3. Several orainzations that are SCRAs deny the fact that they are SCRAs. I'm sitting on what could be the most comprehensive list of CONFIRMED SCRAs, but it is not ready for publication yet. I still need to make a few more phone calls and check some other sources. Let me know if there is significant interest in this topic, and I can work on finishing my list and getting it out there to folks. Absolutely. Not sure where in the heck they get their info from. It was interesting, although a bit scary. Does anyone know if Chexsystems provides an on-line report or is it by snail-mail?